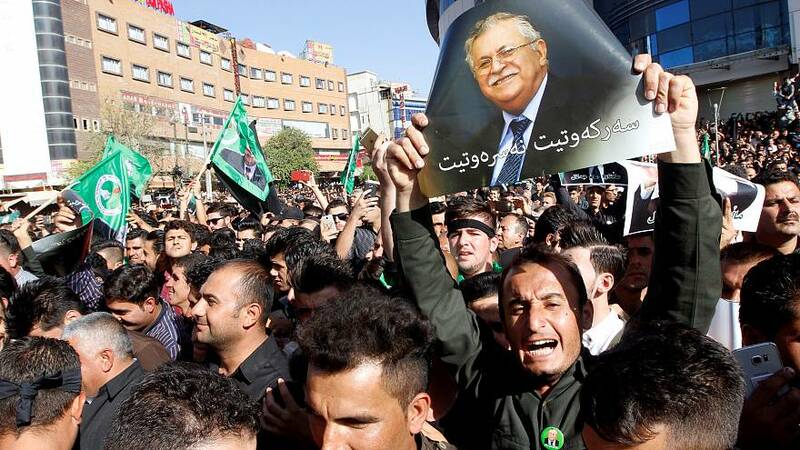 Jalal Talabani, former Iraqi President and a veteran leader of the Kurdish struggle for self-determination, was laid to rest on Friday in his home city of Sulaimaniya in nothern Iraq. Tens of thousands of people lined the streets to pay tribute to the 83-year-old who died on Tuesday in Germany. The Kurdish flag draped his coffin, flown in on a plane given special exemption from a ban on international flights to the Kurdish region, imposed by Iraq’s government, in retaliation for a Kurdish referendum on independence. “Since the start of the Kurdish liberation movement, he brought us to this point. He always looked after us,” said local resident Karim Mohammed. In 2005, two years after the US-led invasion that toppled Saddam Hussein. Talabani became Iraq’s first non-Arab president. He stepped down in 2014, following a stroke. His successor, Fuad Masum, also a Kurd, presided over the ceremony at the airport. Prime Minister Haider al-Abadi, who is demanding that the autonomous Kurdistan Regional Government cancels the outcome of last week’s independence vote, did not come to the funeral. Interior Minister Qasim al-Araji represented the central government. At the airport ceremony, Kurdish regional government leader Masoud Barzani, Talabani’s rival for decades in the movement for self-rule, sat between President Masum and Talabani’s widow Hero. Iranian Foreign Minister Javad Zarif, the highest-ranking foreign official in attendance, repeated Tehran’s assertion that the independence vote was a “strategic mistake”, Iranian media said. Talabani had been too ill to express his views about the independence referendum. His Patriotic Union of Kurdistan (PUK) party, however, gave it only lukewarm support.